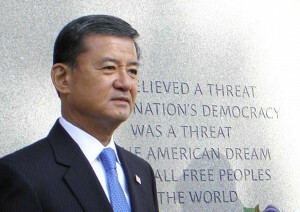 CHARLOTTE, N.C. — U.S. Secretary of Veterans Affairs Eric Shinseki addressed the Democratic National Convention on Wednesday. Following are his remarks, as prepared for delivery. Good evening everyone, especially the veterans in the audience. My name is Eric Shinseki, and I’m a soldier. I spent 38 years in uniform, and as a veteran, I’m here to speak about a president whose devotion to veterans is sincere. It is steadfast, and it is strong — I know this first-hand. I first met Barack Obama in November 2008. I quickly realized we were both shaped and inspired by family members who served in World War II. Three of my uncles helped liberate Europe, and when they returned home they helped raise me. They used the original GI Bill to open small businesses and raise families of their own. They worked hard, played by the rules, and loved this country. I learned those values from them. And the president learned the same values from the veterans in his family. During our first meeting nearly four years ago, the president’s commitment to veterans was clear. He understands that we have the finest military in the world — and we have a commitment to keep faith with our men and women in uniform. Today, our Iraq and Afghanistan warriors have displayed enormous discipline and love of country. We have a moral obligation to care for them when they come home: health care, education, jobs. But above all, we owe veterans dignity and respect. President Obama gets it — he listens, he wants the facts, and the results of his leadership are clear. Since President Obama took office, nearly 800,000 veterans gained access to VA health care. There’s been a historic expansion of treatment for PTSD and traumatic brain injury. President Obama has expanded job training to prepare vets for the jobs of the future. And we’re on track to end veterans’ homelessness by 2015. No president since Franklin Delano Roosevelt has done more for veterans. We could not ask for a stronger advocate. We’ve made tremendous progress under this president’s leadership. But there is much more to be done for the men and women who guarantee our way of life. They have served selflessly — with unmatched valor, sacrifice, and distinction. And President Obama is determined that we will repay the debt we owe them. God bless our veterans, God bless our president, and may God continue to bless this wonderful country of ours.